There is a tremendous effort these days to label the Muslim faith as a peaceful religion. Around the world and especially in this country, this is true of the majority of the people who call themselves Muslims. Sadly however, the religious texts of that faith tell a different story. The Islamic faith has historically been perpetuated by violence and force. We have witnessed the violent aspect of the Islamic religion around the world and even in our own country. Arabs immigrating to America are generally not interested in blending in with our culture as every previous immigrant has done in the past. Instead, they aspire to convert Americans to their way of life, literally, hoping to replace the Constitution with Sharia as the law of the land. In the Middle East, Arab nations are ruled by religious leaders, forcing Islam and Islamic law and traditions on its citizens. Those who reject Islam, primarily Christians, are usually treated as second class citizens, made to pay the jizy, a yearly tax that is required by non-Muslims. Or they are brutalized, tortured and murdered. But according to Muslim holy texts, these atrocities are perfectly acceptable. So what is the fascination with the Muslim faith among young, Black men? W. Fard Muhammad provides the answer. On July the Fourth, the day of America's Independence celebration, He [W. Fard Muhammad] announced the beginning of His mission which was to restore and to resurrect His lost and found people, who were identified as the original members of the Tribe of Shabazz from the Lost Nation of Asia. The lost people of the original nation of African descent, were captured, exploited, and dehumanized to serve as servitude slaves of America for over three centuries. His mission was to teach the downtrodden and defenseless Black people a thorough Knowledge of God and of themselves, and to put them on the road to Self-Independence with a superior culture and higher civilization than they had previously experienced. He taught us the ways of love and peace, of truth and beauty. We are being led into the path of a new spiritual culture and civilization of complete harmony and peace, one of refinement in the pursuit of happiness and eternal joy in the Supreme Knowledge of God and the Science of everything in life. My dear Black, Muslim friends (American, Nation of Islam), W. Fard Muhammad did not reveal a thorough knowledge of the true God. The great truth of salvation that he preached was a false salvation; W. Fard Muhammad was a false Christ, preaching a false Gospel. No person who follows his teaching will ever receive salvation. Salvation only comes through belief and faith in the true Jesus Christ. W. Fard Muhammad claims to be Christ himself, denying that the true Christ has already come in the flesh. The Bible, which was written long before W. Fard Muhammad was born, says this about refusing to acknowledge that Christ has already come in the flesh. There are millions of unsuspecting Black men, women, and children, being drawn into this false religion, not realizing that the same ideals that are offered by the Nation of Islam (led by Louis Farrakhan), are also offered by Christianity. The difference however, is that at the end, salvation only comes to the Christian, not the Muslim. It is true that violence and injustice still plagues Black Americans even today, though not to the extent it did before the Civil Rights movement of the 1960’s. It is also true that some of the violence and injustice is perpetrated by so-called Christians. The truth is, these perpetrators of evil are not true Christians. They are all frauds, giving Christianity a bad reputation. But the religious text (The Holy Bible) of Christianity teaches us what Christianity is really about. True Christians do not participate in injustice and violence against anyone, for any reason. 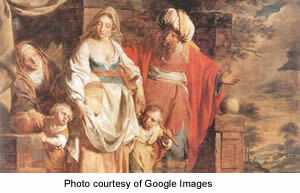 Ishmael was the first son of Abraham and his mother was Hagar, the maidservant of Sarah (Abraham’s wife). God promised Abraham that he would be the father of many nations. Abraham and Sarah got impatient because of their old age, so Sarah told Abraham to sleep with their maidservant so that she could give him a child. Hagar got pregnant and had a son who she named Ishmael. Sarah got jealous of Hagar and mistreated her. Because of this, the angel of the Lord told Hagar, “I will so increase your descendants that they will be too numerous to count.” The angel of the Lord also prophesied about the character of Ishmael. “He will be a wild donkey of a man; his hand will be against everyone and everyone's hand against him, and he will live in hostility toward all his brothers.” Soon after Ishmael was born, Abraham and Sarah did give birth to a son, and his name was Isaac, whom God promised. God also made a covenant with Abraham, promising that if he (Abraham) would obey His commands, He will be their God, and they will be His people. He also promised to make a covenant with Isaac, not Ishmael. This is important to consider, because salvation will only come through Abraham’s seed, and through his legitimate son Isaac. Although God promised that Ishmael will be the father of a great nation, the covenant was made with Isaac. Now in the New Testament, comparisons can be made. A slave woman versus a free woman; a son by the slave woman, versus a son by the free woman; the Old Covenant versus the New Covenant; no inheritance for the son of the slave woman, versus an inheritance for the son of the free woman; children of the slave woman versus children of the free woman. These comparisons are shown to illustrate that salvation only comes to the children of the free woman. If the inheritance is promised to the children of the free woman, then Ishmael will never share in that inheritance and neither will his descendants. If the nation of Islam are those descendants (and they’re not), they will not inherit salvation. "You are now with child and you will have a son. You shall name him Ishmael,  for the LORD has heard of your misery. He will be a wild donkey of a man; his hand will be against everyone and everyone's hand against him, and he will live in hostility toward  all his brothers [ Isaac - Christianity ]." 16:11 Ishmael means God hears . 16:14 Beer Lahai Roi means well of the Living One who sees me . 17:5 Abram means exalted father . 17:5 Abraham means father of many . 17:19 Isaac means he laughs . Do you believe in God? Muslims say they believe in God. They call their god Allah. Allah means God in Arabic. Considering all that we have seen above, it might appear that since Abraham believed in and worshipped the One True God and Ishmael is the son of Abraham, Ishmael and his people might also have believed in and worshipped the same God as Abraham. But we know that Abraham and Ishmael were not descendants of the prophet Muhammad. Muhammad claims to have been visited by the angel Gabriel. He is the true founder of Islam. Around 610 A.D., over a period of 3 years he preached unity to the Arabs, teaching the people all that the angel Gabriel supposedly told him. Muhammad taught that there is only one god, not many. Muhammad chose the moon god; a pagan god in Arabia during pre- Islamic times. Muhammad called this god, Allah. Today, all of the symbolism and ritualism that was directed toward the pagan, moon god, is practiced by Muslims worldwide. This can be confusing since Allah means God in Arabic, but the fact remains, Muslims do not believe in nor do they worship the same God as Abraham and Isaac. So my Muslim friends (Nation of Islam), I urge you to consider who you should follow, Jesus Christ the proven Messiah, or W. Fard Muhammad, the false Messiah? If you still believe the Prophet Muhammad is a direct descendant of Abraham through Ishmael, why would you be a child of the slave woman when you can be a child of the free woman?